This 49cc EPA gas powered scooter approved engine comes with removable seat to provide hours of enjoyable riding. 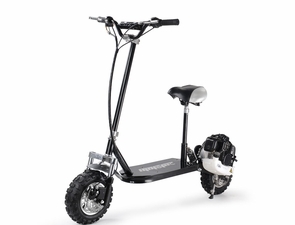 Great low cost family scooter with 11 inch tires, front/rear suspension, front/rear disc brakes, and 3 speed gear box is sure to take any member of the family anywhere they need to go. Extremely durable and arrives mostly assembled in a really big box! The range is 20+ miles for each tank. Holds up to 250 pounds! The 49cc EZ starting gasoline 2-stroke engine and 3 speed transmission for optimal performance and nearly zero maintenance. Buy today and you will receive the scooter tool kit that fits the common nuts and bolts on the scooter, and a removable seat kit that does not have to be installed on the scooter, but it's included FREE and it is your choice to install it or not. This model is our second best seller. Make this gas scooter yours today for our super sale price. Yes, we carry all spare parts just in case to provide years of scootering fun! Buy today from the real scooter enthusiasts that have been in the scooter business for almost 20 years! Suggested Max Weight: 250 lbs.